Failure blood pressure − no longer a rarity in childhood. Frequent deviations from average indicators can indicate a serious condition. Parents need to constantly monitor and know the limits of blood pressure in children based on their age. What is the pressure for children is considered normal? Blood pressure is expressed by two values: systolic (the highest pressure of blood on vessel walls) and diastolic (lowest). Children have a more elastic vessel walls, their lumen is wider, better-developed capillary network and blood pressure less than in adults. That is why blood pressure in children is much lower. To calculate normal blood pressure in children cardiologists and pediatricians use a special formula. Norms systolic blood pressure in children under one year is determined by the formula 76+2n, where n is the number of months. In children from 1 year to use the formula I. Voronin: 90+2n, where n equals the number of years. The upper threshold of the norm is 105+2n, bottom – 75+2n. Diastolic blood pressure in children under the age of 12 months is approximately 0.5 of the maximum systolic blood pressure. In children older than 12 months when the definition of rules using a formula of 60+n, where n is the number of years. The upper limit is 75+n bottom – 45+n. To 5 years in boys and in girls, the pressure is the same, after a 5 – boys above. At the age of 12-14 years, it increases in girls after 16 and boys again begin to outperform girls in magnitude of arterial pressure. - concomitant diseases and other causes. 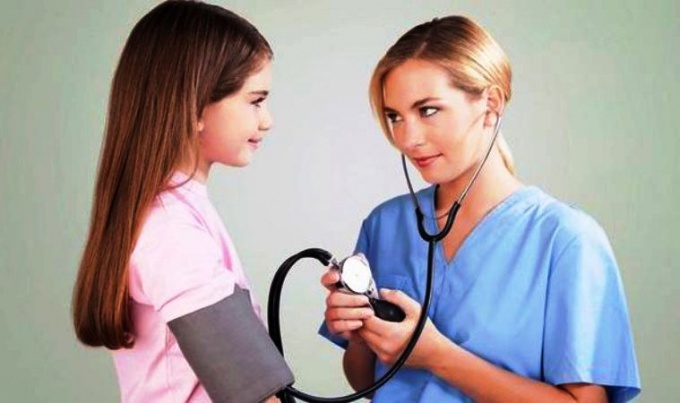 How to measure blood pressure in kids? When measuring pressure in a child need to use the special cuffs. Use adult cuffs may distort the result. Blood pressure in children is measured with the tonometer after 5-10 minute rest in comfortable and quiet conditions in the sitting position (for older children) and in the supine position (for infants). The cubital fossa should be at heart level. The pressure is measured 2 times on both hands with a break of 2-4 minutes, is always given greater importance. In childhood can often offset blood pressure as downward and upward. To avoid surges, the children definitely need to do exercises, to share intellectual and physical labor and to be extremely careful about your health. You need to constantly follow the indicators and any deviations to go to the doctor.